Imperial Generals are generic Imperial Legion officers which appear during various Civil War quests. 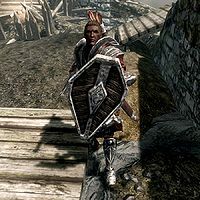 They wear a set of Imperial armor without a helmet and defends themselves with an Imperial sword and Imperial light shield, supplemented by an Imperial bow with twenty steel arrows. They also carry a backup steel dagger and have a chance of carrying a random Amulet of the Divines (other than for Talos), a random food or drink, and/or a small amount of gold. Curiously, despite being a higher rank than the common Imperial Soldier, they seem to be easier to kill than the common soldier. This page was last modified on 11 April 2015, at 19:37.